Now that I have your attention with my intriguing post title, allow me to explain just what I mean… and boiling frogs and organ donation do indeed feature in this little blog post! All the recent furore over Facebook privacy has shown no signs of abating…and for good reason. Privacy, after all, is a sensitive and important issue. Or is it? There’s no doubt that Facebook has made a startling entrance in the online world and taken over our browsers and mobile screens rather quickly. Official stats from Facebook claim that 400 million users currently use the service and almost half log on every day. Globally it appears that people now spend over 500 billion minutes per month on Facebook…an enviable record for any platform. The amount of information shared on the site has also grown in leaps and bounds. Users typically share a substantial amount of personal information, photos and information on personal preferences. Choices of who we connect and communicate with also give away loads of behavioural information (in fact, Mark Zuckerberg claims he can predict a relationship breakup in advance of it actually happening, plus who you may end up with next, with a 33% accuracy based on this data alone). Matt McKeon recently put together a great graphic that illustrates the amount of data that is now publicly available via your typical Facebook account. 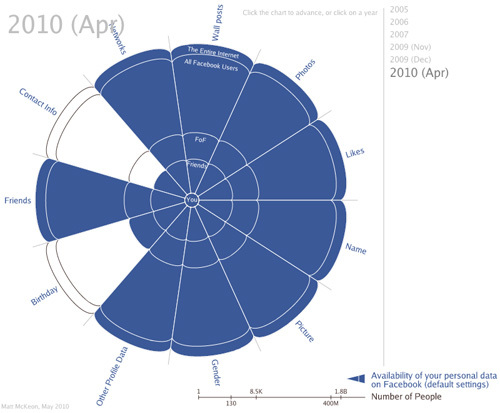 Check out where we stand in April 2010 in the graphic below…and visit the site to compare how things have changed since 2005. So how did all this happen? And why? Facebook obviously does not have a vendetta against user privacy…but there’s no denying that Facebook stands to benefit immensely by making the platform a lot more open and connected. For example, simply the act of making updates and other information accessible on Search Engines was a huge step in increasing the volume of information available on the public web…as well as capturing additional incoming traffic to the site from search. The proposed Facebook “open graph” will also be nothing short of game-changing and revolutionary. 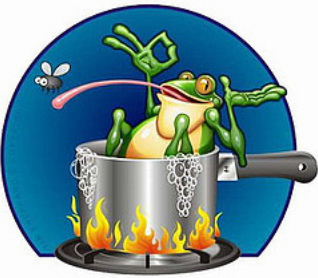 The boiling frog story is a widespread anecdote describing a frog slowly being boiled alive. The premise is that if a frog is placed in boiling water, it will jump out, but if it is placed in cold water that is slowly heated, it will not perceive the danger and will be cooked to death. The story is often used as a metaphor for the inability of people to react to significant changes that occur gradually. The central issue in all the privacy hoo-ha has been the fact that very few users actually understand what they’re sharing and with who… Facebook has all the controls there to allow you to restrict your privacy settings but they’re too many and too complicated for most to bother with (or even be aware of). Plus the privacy changes have crept up on most of us…the infographic comparing these changes since 2005 illustrate this fact well. I guess the recent furore was a little more apparent because the “water” was heated a little too quickly? This time the “frogs” noticed…but how many will actually jump out of the nice, warm water before it gets too hot? Organ Donation: The other question I guess Facebook addressed very cleverly is “how do you implement a seemingly distasteful change but ensure you attain a critical mass of subscribers?”. After all these two elements are at odds with each other… if something is distasteful, people simply won’t sign up for it. Unless of course, you opt them in automatically i.e. if you don’t like it…opt out! This is where the organ donation anecdote comes in…there is the popular example of certain countries (e.g. Spain, Belgium, Austria) where organ donation is ‘assumed’, with citizens having to opt-out if they do not wish to participate. 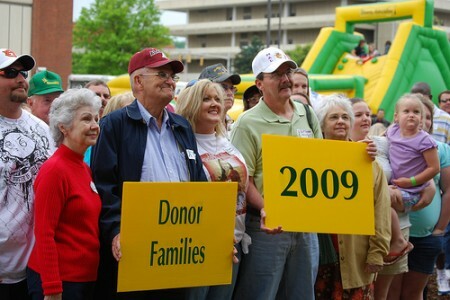 These countries have managed to greatly increase the number of donors compared to countries with systems that require opt-in organ donation. Organ donation is an extremely personal, life-impacting decision….if our inherent human laziness can impact a ‘subscribed’ donor base in such a dramatic manner, surely the issue of privacy pales in comparison? Facebook seems to have followed the same approach and opted-in it’s 400 million strong base of users to share the maximum information by default. While many enraged users have chosen to leave the platform or changed their privacy controls, most haven’t…and the dent in the overall user base has been almost unnoticeable. So there you have it…the connection between organ donation, boiling frogs and Facebook! Some of this is an attempt at humor (obviously), but the two examples do highlight more serious underlying issues that seem to have been at work. What happens next remains to be seen…Facebook is likely to bow to pressure to simplify its privacy controls somewhat. But will this be enough to protect the privacy of most users? And on a broader, more culture/future-trend oriented note, are we simply headed towards a more open, transparent “sharing” society…and should those complaining just deal with it? [UPDATE] June 2010: Facebook DID go about announcing and implementing some privacy setting simplification…however the controversy rages on, with many believing that the move simply wasn’t enough. Really cool comparisons, you do put things in an interesting perspective. There was another graphic of the evolution of Facebook privacy which I found to be an eye opener: http://www.flytip.com/blog/?p=2880 . The boiling frog story is a widespread anecdote describing a frog slowly being boiled alive. The premise is that if a frog is placed in boiling water, it will jump out, but if it is placed in cold water that is slowly heated, it will not perceive the danger and will be cooked to death. The story is often used as a metaphor for the inability of people to react to significant changes that occur gradually.- yes,yes,sure,I agree to all these words.